Red is rapidly becoming my new favorite color. I don’t know what’s wrong with me exactly. Maybe it’s because Valentine’s Day was last week. 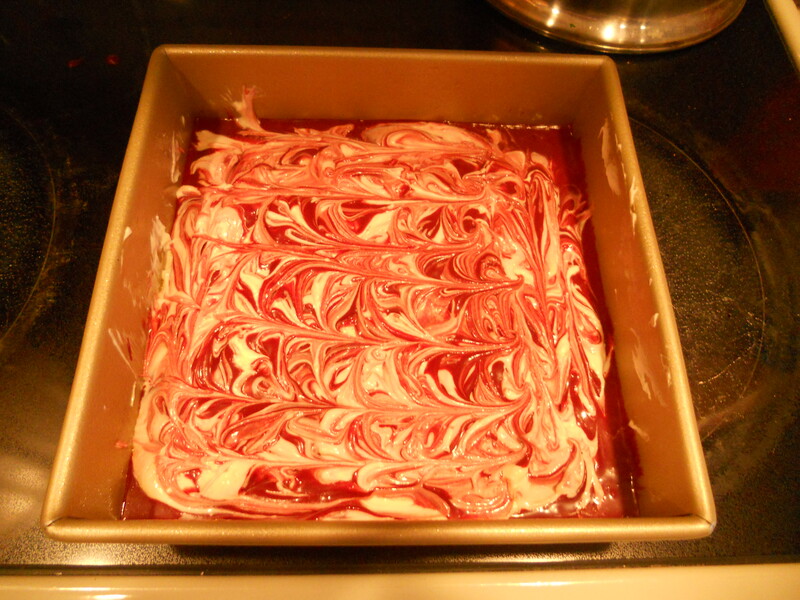 Maybe I can’t resist the decadent aroma of red lusciousness baking in the oven. Or maybe it’s the simple fact that I almost always have the standard ingredients on hand. My thought process went as such: I had an extra 8-ounce package of low-fat cream cheese in my fridge and nothing to do the other day after work (besides spend some quality time on my abs at the gym) until 9 o’clock. That left me a substantial amount of time to make something special for the blog and the boyfriend. In my search for cream cheese recipes, I clicked through fellow food blogs for ideas. Cakes with cream cheese glazes, nah. Banana bread with a cream cheese filling? Intriguing, but no. 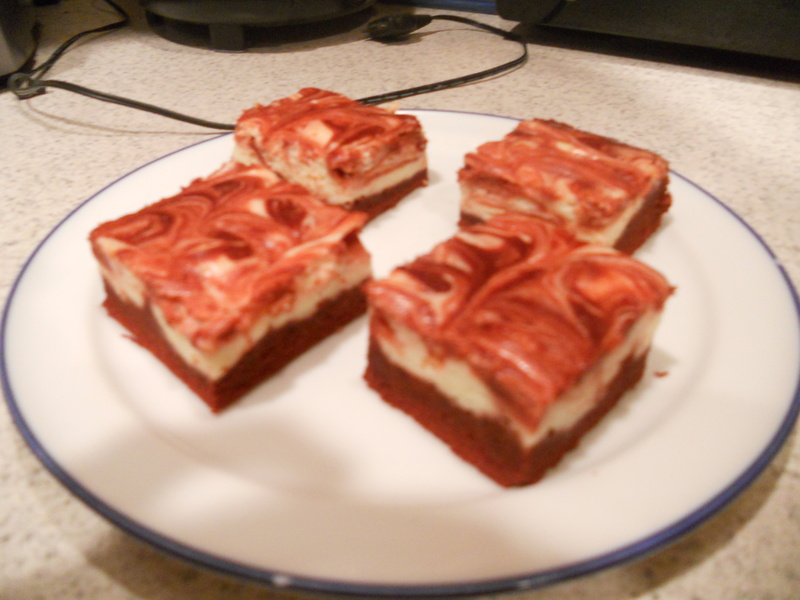 Red velvet swirl brownies? Ding, ding, ding.. We have a winner! I modified the recipe – big shock, right? I’ve never been a big fan of “real” butter to begin with so, as usual, I used my Brummel and Brown margarine spread. It’s made from natural yogurt (hey, don’t knock it till you try it.) and has significantly better nutritional stats than butter. I also used a sugar-Splenda mix to cut back on the amount of real sugar in the recipe. Oh, and of course, I substituted low-fat cream cheese for regular. Preheat oven to 350 degrees. Lightly spray an 8 by 8-inch baking pan with non-stick cooking spray, and set aside. 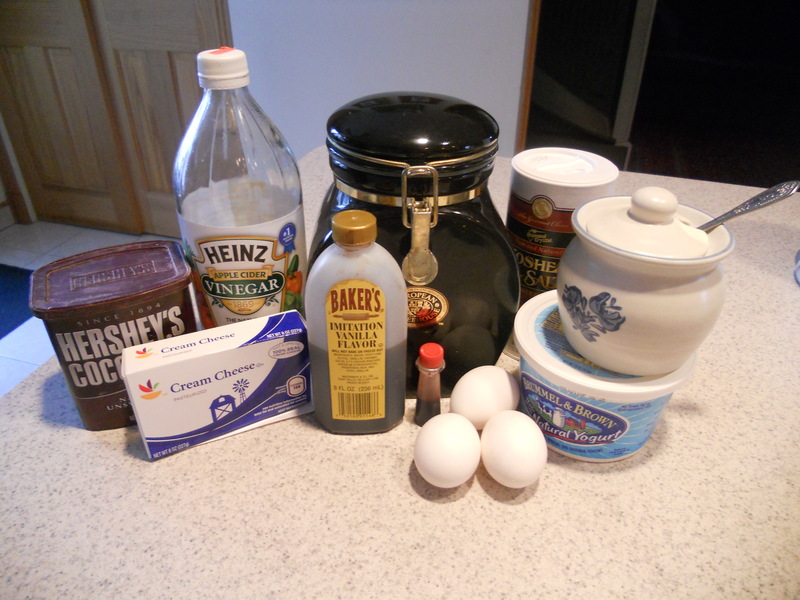 To make the brownies: Pour melted “butter” to a large bowl and add the sugar, Splenda, vanilla, cocoa powder, salt, food coloring, and vinegar (in that order), mixing between additions. Whisk the eggs in a small bowl and stir it into the cocoa mixture. Fold in the flour with a spatula until lightly combined. 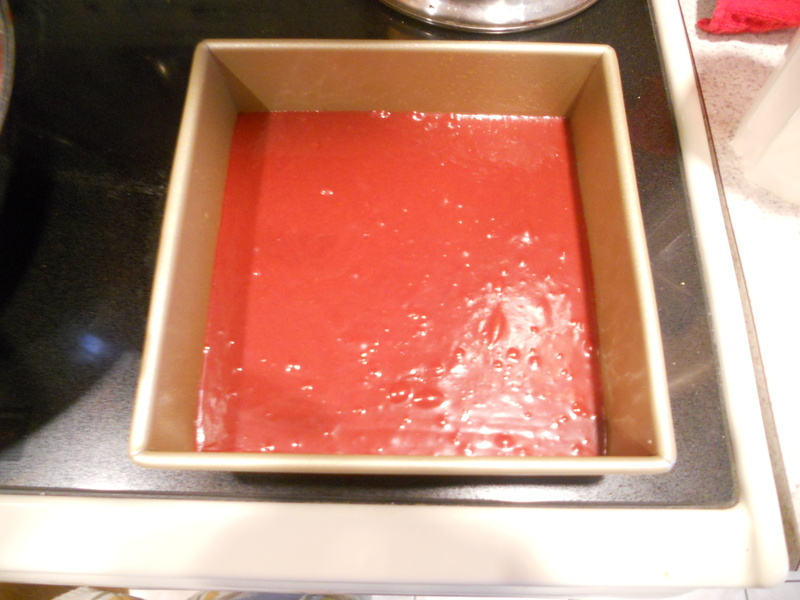 Pour the batter into the prepared baking pan, saving 1/4 cup of the batter for the top.